Human regulatory T cells (Treg) are essential for the maintenance of immune tolerance. However, the mechanisms they use to mediate suppression remain controversial. Although IL-35 has been shown to play an important role in Treg-mediated suppression in mice, recent studies have questioned its relevance in human Treg. In this study, we show that human Treg express and require IL-35 for maximal suppressive capacity. Substantial upregulation of EBI3 and IL12A, but not IL10 and TGFB, was observed in activated human Treg compared with conventional T cells (Tconv). Contact-independent Treg-mediated suppression was IL-35 dependent and did not require IL-10 or TGF-β. Lastly, human Treg-mediated suppression led to the conversion of the suppressed Tconv into iTr35 cells, an IL-35–induced Treg population, in an IL-35–dependent manner. 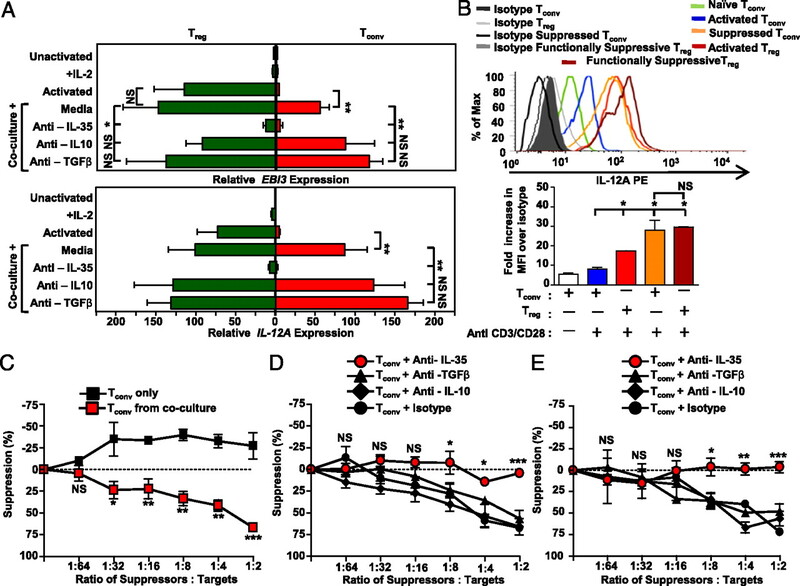 Thus, IL-35 contributes to human Treg-mediated suppression, and its conversion of suppressed target Tconv into IL-35–induced Treg may contribute to infectious tolerance. Interleukin-35 (EBI3–IL-12α [IL12A] heterodimer) is required for murine regulatory T cells (Treg) function (1) and has been shown to induce the conversion of murine and human conventional T cells (Tconv) into IL-35–induced Treg (iTr35) (2). Furthermore, IL-35 is produced by human Tconv exposed to rhinovirus-infected dendritic cells (3) and human peripheral blood CD4+ T cells from chronic hepatitis B virus-infected patients (4). However, two studies have suggested that human Treg neither express nor produce IL-35, increasing the controversy surrounding the physiological importance of IL-35 in human Treg (5, 6). Several studies have shown that both murine and human Treg can mediate infectious tolerance, the contagious spread of suppressive capacity from Treg to the suppressed target cell. The mechanisms used to mediate this induction and the subsequent mechanisms used by this induced regulatory population to mediate suppression remain obscure (7–9). However, studies with human Treg have suggested that IL-10 and TGF-β may contribute to these events (10, 11). Nevertheless, mechanistic insight into the regulatory preferences of human Treg is lacking. CD4+ T cells were obtained and purified from human cord blood or aphaseresis rings, as previously described (2, 12). Purity was verified by intracellular staining of FOXP3 (eBioscience, San Diego, CA). Treg and Tconv were expanded in X-VIVO medium containing beads coated with anti-CD3 and anti-CD28 (bead/cell ratio 1:1), 20% (v/v) human sera (Lonza, Conshohocken, PA), and either 500 IU/ml human IL-2 for Treg or 100 IU/ml for Tconv (13–15). For CFSE or eFluor670 labeling, freshly purified naive Tconv or Treg were resuspended in PBS (0.1% BSA) at 2 × 106 cells/ml, incubated with CFSE or eFluor670 (1 μM) for 10 min at 37°C, stopped with ice-cold PBS, and washed three times in culture media. All experiments using expanded Treg were performed at least 9 d postactivation. Analysis was performed as previously described (1, 2). Sequences are detailed in Supplemental Table I. Analysis was performed as previously described (1, 2). PE-conjugated anti–IL-12A (clone 27537) and IgG1 (isotype control; clone 25711) were used for immunofluorescence and intracellular staining (R&D Systems, Minneapolis, MN). The 8E fix/perm buffer used for intracellular staining of IL-12A was kindly provided by Dario Campana (St. Jude Children’s Research Hospital). Assay was performed as previously described (2, 12). Briefly, 96-well round-bottom microtiter plates were used to perform standard suppression assays. Freshly purified 5 × 104 naive Tconv were activated with anti-CD3/anti-CD28–coated latex beads and IL-2 (10 IU/ml) and used as target cells with varying concentrations of naive Treg, in vitro-activated Treg, or CFSE-labeled suppressed Tconv. The cultures were pulsed with 1 μCi [3H]thymidine for the final 8 h of the 5-d assay and harvested with a Packard harvester (PerkinElmer). Counts per minute were determined using a Packard Matrix 96 direct counter (PerkinElmer, Waltham, MA). Transwell experiments were performed in 96-well Transwell plates with a 0.4 μM pore size (Millipore, Billercia, MA). Freshly purified naive Tconv were activated as described above and used as target cells in the bottom chamber of the 96-well plate. The suppressor populations in the top chamber of the Transwell were activated Treg, activated Treg cultured with naive Tconv, or suppressed Tconv. In some experiments, cocultured naive Tconv were fixed with 4% formaldehyde for 10 min at room temperature and washed twice prior to assay. The suppressor population was activated with anti-CD3/anti-CD28–coated latex beads and IL-2 (40 IU/ml). Where indicated, neutralizing anti-Ebi3 (clone V1.4F5.25) (2) anti–IL-10 (JES39D7; BioLegend, San Diego, CA), anti–TGF-β (1D11; R&D Systems), or isotype controls were added. A combination of both anti-Ebi3 (clone V1.4F5.25) and anti-IL12A (clone 27537) was used at indicated concentrations when anti–IL-35 Ab was used in neutralization studies. After 112 h, the top chambers were removed and [3H]thymidine was added to the bottom chambers for the final 8 h of the 5-d assay. Cultures were harvested with a Packard harvester (PerkinElmer), and counts per minute were determined using a Packard Matrix 96 direct counter (PerkinElmer). Human umbilical cord blood is an ideal source of naive Tconv and naive Treg due to their lack of previous antigenic exposure and thus the ease with which they can be reliably purified based on CD4 and CD25 expression (data not shown). Naive cord blood Treg expressed low levels of mRNA encoding both the EBI3 and IL12A subunits of IL-35 compared with Tconv (data not shown). However, following activation with anti-CD3/anti-CD28–coated beads, EBI3 and IL12A were substantially upregulated in Treg (>35-fold over Tconv) (Fig. 1A). Although a similar observation was made with Treg isolated from adult PBMC, the fold upregulation was less, perhaps due to the difficultly of generating pure populations from adult cells (Supplemental Fig. 1A). EBI3 and IL12A expression was not induced or influenced by IL-2, as the inclusion of reduced concentrations with Treg or its inclusion with Tconv (100 IU/ml) had no affect (note that >100 IU/ml IL-2 induced Tconv death). Surprisingly, expression of IL10 and TGFB mRNA in cord blood Treg was modest in comparison with EBI3 and IL12A. Expression of mRNA encoding the other IL-12 family members, IL23 (p19), IL27 (p28), and IL12B (p40), was not upregulated in Treg isolated from either cords or PBMC, inferring that IL-35 may be the only IL-12 family cytokine human Treg to have the capacity to upregulate upon activation compared with Tconv (Fig. 1A, Supplemental Fig. 1A). Expression of EBI3 and IL12A following activation remained low until day 3 postactivation, when there was a steep increase compared with similarly activated Tconv (>100-fold), which was maintained through day 9 (Fig. 1B, 1C). We note that previous studies suggesting that human Treg do not express EBI3 and IL12A only analyzed expression in resting or activated Treg up to day 2 poststimulation (10, 11). Human Treg express IL-35. CD4+CD25− (Tconv) and CD4+CD25+ (Treg) were purified by FACS from cord blood. A, Relative mRNA expression in Treg was determined. B and C, Cell types noted were analyzed for EBI3 or IL12A expression at the indicated days postactivation. Naive Tconv were used for normalization (arbitrarily set to 1). D, At indicated time points, Tconv (blue) and Treg (red) were stained with anti–IL-12A or isotype control. A representative histogram (left panels) and the mean percentage of IL-12A high cells (right panels) are depicted. E, Activated cells were restimulated with PMA plus ionomycin for 6 h and then stained with an isotype control or anti–IL-12A (yellow) plus phalloidin (actin, gray) and DAPI (nucleus, blue). Original magnification ×63 Data represent the mean ± SEM of 4 to 5 (A), 5 (B, C, E), and 8, 13, and 11 (D) independent experiments at the three time points indicated. *p < 0.05, **p < 0.005, ***p < 0.001. Comparable, minimal intracellular expression of IL12A (p35) was seen in resting human Treg and CD4+ and CD8+ Tconv (data not shown). However, IL-12A expression increases ∼10-fold following activation of human Treg but not Tconv, as determined by flow cytometry (Fig. 1D) and immunofluorescence (Fig. 1E). Although expression was bimodal (∼30%) 9 d postactivation, subsequent restimulation and analysis 3 d later resulted in ∼100% expression of intracellular IL-12A and further increases in IL-12A mean fluorescence (∼30-fold) and EBI3 and IL12A mRNA expression (Fig. 1D, Supplemental Fig. 2A). It is possible that this bimodal IL-12A expression is related to the activation state of the Treg. It is important to note that neither activation nor reactivation substantially altered the low-level intracellular expression of IL-12A in CD4+ and CD8+ Tconv (Fig. 1D and data not shown). The basal amount of IL-35 expression detected in Tconv could be attributed to their activation state, as it has been shown that activated human Tconv also express FOXP3, TGF-β, and IL-10 and thus may express small amounts of IL-12A and EBI3, or this could be due to some low-level background due to the staining procedure (5). The relationship between FOXP3 and IL-35 expression following Tconv and Treg activation was then assessed. Whereas all the activated Tconv and Treg populations examined expressed comparable FOXP3 IL-12A expression differed (Supplemental Fig. 1B). Restimulated Treg exhibit the highest IL-12A expression, whereas a high percentage of Treg-suppressed Tconv express IL-12A and thus may be iTr35. Although activated Tconv express low levels of IL-12A, despite high FOXP3 expression, they are unlikely to secrete IL-35 given the absence of Ebi3 mRNA. Taken together, these data demonstrate that human Treg express IL-35 to a significantly greater extent than Tconv. Furthermore, expression of FOXP3 does not necessarily endow T cells with the ability to express IL-12A/EBI3 and secrete IL-35 (6). We next assessed whether IL-35 secretion by human Treg contributed to their function. Naive human cord blood Treg possess minimal suppressive capacity in vitro, whereas activated Treg, which exhibit high levels of EBI3 and IL12A mRNA expression, are potently suppressive (data not shown). Our initial analysis suggested that IL-35 neutralization in a conventional in vitro Treg assay had a minimal effect on their suppressive capacity, likely due to the multiple contact-dependent and contact-independent mechanisms at their disposal (data not shown) (16, 17). However, activated human Treg have also been shown to mediate potent suppression when separated from their Tconv targets by a permeable Transwell membrane, emphasizing the importance of soluble factors, such as inhibitory cytokines, in mediating suppression (10, 11). 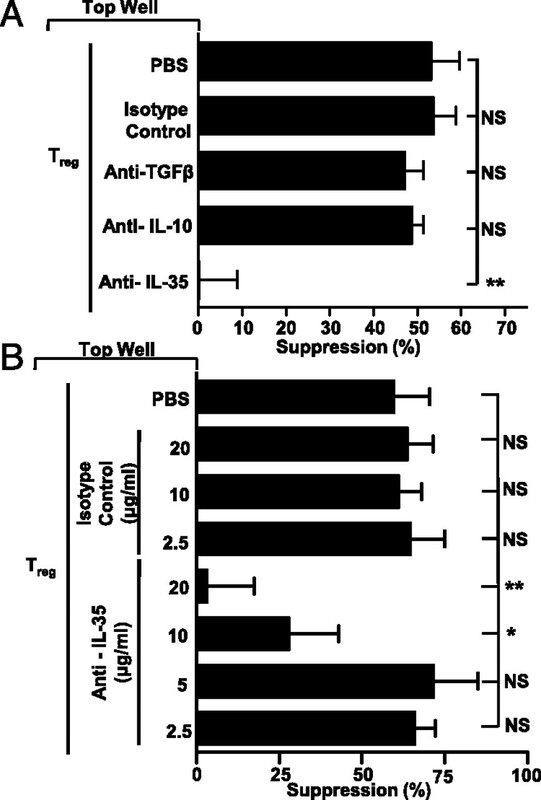 Consequently, we assessed the relative contribution of IL-35 as well as IL-10 and TGF-β, two inhibitory cytokines implicated in mediating contact-independent suppression by human Treg (10, 11). Surprisingly, neutralizing anti–IL-10 and anti–TGF-β had no effect on Treg-mediated suppression (Fig. 2A). In contrast, neutralizing anti–IL-35 completely blocked suppression. 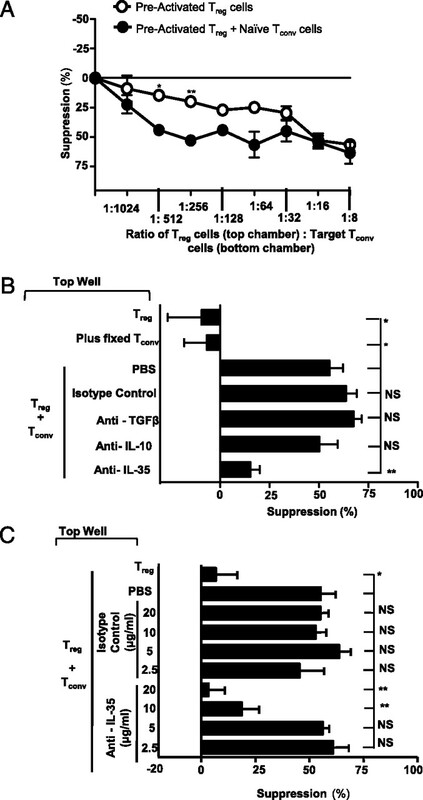 Subsequent analysis demonstrated dose-dependent inhibition of Treg-mediated suppression by neutralizing anti–IL-35 (Fig. 2B). Similar observations were also made with adult PBL-derived CD4+CD25+CD45RA− Treg (data not shown). These data suggest that IL-35, but not IL-10 and TGF-β, is required to mediate contact-independent human Treg-mediated suppression. 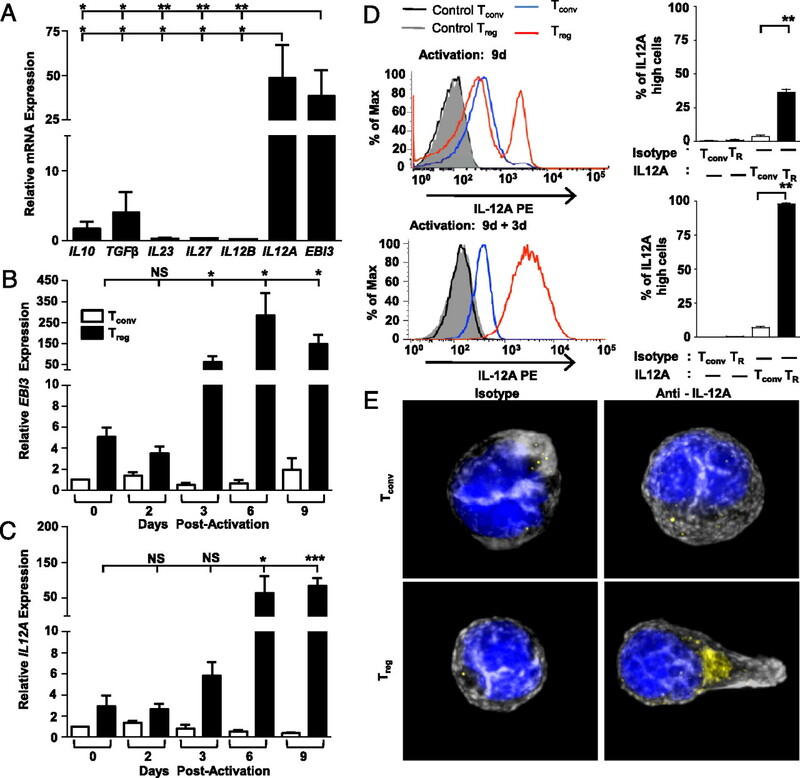 Treg-mediated contact-independent suppression is IL-35 dependent. A, Transwell suppression assay was performed with activated Treg stimulated in the top chamber of a Transwell culture plate in the presence or absence of indicated Abs (all at 10 μg/ml). Naive target Tconv were placed in the bottom chamber with anti-CD3/CD28–coated beads. The Treg (top chamber)/Tconv (bottom chamber) ratio was 1:8. B, Assay was established as above in the presence of a titration of isotype control or neutralizing IL-35 mAbs. Counts per minute of activated Tconv alone, in the absence of any suppression, were 50,000–120,000. Data represent the mean ± SEM of 3–10 independent experiments. *p < 0.05, **p < 0.005. Infectious tolerance is thought to play a substantial role in propagating Treg-mediated immune control, but the mechanisms used to convert suppressed Tconv into an induced regulatory population and the mechanisms by which they in turn suppress third-party Tconv remain contentious. Previous studies have suggested that human Treg mediate the conversion of cocultured Tconv into IL-10– or TGF-β–induced Treg populations (10, 11). More recently, we showed that IL-35 production by murine Treg mediates the conversion of suppressed target Tconv into an induced Treg population, termed iTr35, that mediate suppression via IL-35, but not IL-10 or TGF-β (2, 18). However, it is not known if human Treg can generate iTr35 cells and if they contribute to immune regulation. Thus, we first assessed whether IL-35 expression and production by human Treg was modulated following contact with Tconv and whether the latter were induced to express IL-35. Modest increases in EBI3 and IL12A mRNA and intracellular IL-12A expression were observed in functionally suppressive, cocultured Treg compared with activated Treg (Fig. 3A, 3B). However, suppressed, cocultured Tconv substantially upregulated EBI3 and IL12A mRNA and intracellular IL-12A expression to a level indistinguishable from maximally activated human Treg (Fig. 3A, 3B). Contrary to recent studies, we saw modest expression of IL10 and TGFB mRNA in activated human Treg and no evidence for increased expression in the functionally suppressive Treg or suppressed Tconv isolated from cocultures (Supplemental Fig. 2B). Treg-mediated induction of iTr35. A and B, Activated Treg were labeled with eFluor670 and cultured with CFSE-labeled naive Tconv at a ratio of 1:4 in the presence anti-CD3/CD28–coated beads and IL-2 (10 IU/ml) with or without neutralizing mAbs against IL-35, TGF-β, or IL-10 (10 μg/ml) for 72 h. Cells were purified by FACS on day 3 and analyzed for relative expression of EBI3 (A, upper panel) and IL12A (A, lower panel) and intracellular expression of IL-12A (B). C, Regulatory capacity of the sorted suppressed Tconv was determined using naive Tconv as targets. D, Regulatory capacity of suppressed Tconv generated in the presence of neutralizing IL-35, IL-10, TGF-β, or an isotype control (10 μg/ml) was determined as in C. E, Assay performed as in D except that the neutralizing mAbs were added during the secondary suppression assay. Counts per minute of activated Tconv alone, in the absence of any suppression, were 70,000–125,000. Data represent the mean ± SEM of 8–14 (A) and 3 (B–E) independent experiments. *p < 0.05, **p < 0.005, ***p < 0.001. To determine if the increased EBI3 and IL12A expression observed was driven by IL-35, IL-10, and/or TGF-β, Treg/Tconv cocultures were established in the presence of neutralizing Abs. EBI3 and IL12A mRNA expression was not significantly affected by neutralization of TGF-β or IL-10 (Fig. 3A). Conversely, in the presence of neutralizing anti–IL-35, EBI3 and IL12A expression was substantially reduced in cocultured Treg and essentially prevented in cocultured Tconv (Fig. 3A). These data suggest that IL-35 generation is induced and expression maintained by IL-35 in an autocrine (in Treg) and paracrine (in suppressed Tconv) fashion following cell contact between human Treg and Tconv. We have previously shown that activation of human Tconv in the presence of IL-35 mediates the generation of an induced Treg population, iTr35 (2). The substantial expression of EBI3 and IL12A mRNA and intracellular IL-12A expression in suppressed Tconv, and the requirement for IL-35 to mediate this induction, infers the generation of iTr35 (2). This prompted us to investigate whether these suppressed Tconv gained regulatory activity and determine the mechanism of conversion and suppression. CFSE-labeled suppressed Tconv were purified from Treg/Tconv cocultures after 3 d and their regulatory capacity determined in a secondary, standard in vitro suppression assay. These Treg-suppressed Tconv exhibited potent, dose-dependent suppressive capacity, as previously reported (Fig. 3C). To determine the cytokines responsible for induction of this regulatory capacity, Treg/Tconv cocultures were performed in the presence or absence neutralizing anti–IL-35, TGF-β, or IL-10 prior to purification and secondary suppression assay. When suppressed Tconv were isolated from cocultures established in the presence of neutralizing anti–IL-35, no regulatory potential was observed (Fig. 3D). In contrast, the addition of neutralizing anti–IL-10 or anti–TGF-β had no effect. To determine the cytokine responsible for the regulatory capacity exhibited by the suppressed Tconv, neutralizing Abs were added to the secondary suppression assay. As above, neutralizing anti–IL-35 blocked their regulatory capacity, whereas neutralizing Abs to IL-10 and TGF-β had no effect (Fig. 3E). Taken together, these data suggest that human Treg-derived IL-35 is required for the conversion of suppressed human Tconv into iTr35 cells, which subsequently suppress via IL-35. Finally, we asked whether the iTr35 cells generated by IL-35–producing human Treg can mediate contact-independent suppression during Treg insufficiency. At low Treg (top chamber)/target Tconv (bottom chamber) ratios (1:256), the regulatory capacity of Treg is insufficient to mediate effective suppression, a scenario that might occur in vivo (Fig. 4A). However, if fresh, naive Tconv were added to the top well under these conditions, substantial cell contact-independent suppression across a Transwell membrane was observed (∼60%), raising the possibility that iTr35 generated by the human Treg could compensate for this Treg insufficiency. Indeed, this suppression was lost when the naive Tconv added to the top well were fixed (and thus could not be converted to iTr35), confirming that iTr35 generated in the presence of very low numbers of human Treg can mediate contact-independent suppression (Fig. 4B). Addition of neutralizing mAbs confirmed that the suppression observed was mediated by IL-35 and not TGF-β or IL-10 (Fig. 4B, 4C). These data suggest that human Treg-generated iTr35 might contribute to global suppression and mediate infectious tolerance during Treg insufficiency. IL-35–expressing Treg can mediate suppression across the Transwell. A, Transwell suppression assay was set up as in Fig. 2A with either activated Treg stimulated alone or activated Treg stimulated with naive Tconv in the top chamber. B, Assays were set up as in Fig. 2A, except that the cells in top chamber were at 1:256 ratio with the target Tconv. C, Assays were set up as above in presence of a titration of the Abs indicated. Counts per minute of activated Tconv alone, in the absence of any suppression, were 40,000–150,000. Data represent the mean ± SEM of three independent experiments. *p < 0.05, **p < 0.0005. Our results demonstrate for the first time, to our knowledge, that activated cord blood- and PBMC-derived human Treg express and secrete IL-35, which contributes significantly to their suppressive capacity (19). Surprisingly, there appeared to be a minimal role of IL-10 and TGF-β. These data are in contrast with previous reports suggesting that IL-35 is not expressed by Treg isolated from PBMCs (5) and that IL-35 does not play a role in suppression mediated by FOXP3-transduced T cells (6). These discrepancies may be due to the timing of analysis, purification techniques, and/or reagents used and the populations under analysis. In addition, our data suggest that human Treg-derived IL-35 mediates the conversion of suppressed Tconv into iTr35 that subsequently suppress via IL-35 in a manner analogous to our observations in the mouse (2). These parallels raise the possibility that iTr35 may constitute a mechanism of infectious tolerance in humans. These findings suggest that IL-35 neutralization may represent a valid immunotherapeutic strategy for the treatment of cancer and conditions in which excessive regulatory control might exist. D.A.A.V., L.W.C., and C.J.W. have submitted patents that are pending and are entitled to a share in net income generated from licensing of these patent rights for commercial development. We thank Kate Vignali for technical assistance, Jessie Ni for Abs, Dario Campana for the 8E permeabilization buffer, Brandon Triplett, Michelle Howard, and Melissa McKenna at St. Louis Cord Blood Bank for cord blood samples, and the staff of the Blood Donor Centre at St. Jude Children’s Research Hospital for aphaeresis rings. We also thank Richard Cross, Greig Lennon, and Stephanie Morgan for FACS and the staff of the Hartwell Center for Biotechnology and Bioinformatics at St. Jude for real-time PCR primer/probe synthesis. This work was supported by the National Institutes of Health (Grants R01 AI39480 and AI091977 to D.A.A.V. ), a sponsored research agreement from NovoNordisk (to D.A.A.V. ), an Individual National Research Service award (F32 AI072816 to L.W.C. ), a National Cancer Institute Comprehensive Cancer Center Support CORE grant (CA21765 to D.A.A.V. ), and the American Lebanese Syrian Associated Charities (to D.A.A.V.).
. 2010. Human rhinoviruses induce IL-35-producing Treg via induction of B7-H1 (CD274) and sialoadhesin (CD169) on DC. Eur. J. Immunol. 40: 321–329.
. 2011. Detectable expression of IL-35 in CD4(+) T cells from peripheral blood of chronic Hepatitis B patients. Clin. Immunol. 139: 1–5.
. 2008. Inducible reprogramming of human T cells into Treg cells by a conditionally active form of FOXP3. Eur. J. Immunol. 38: 3282–3289.
. 1971. Infectious immunological tolerance. Immunology 21: 903–914.
. 1993. “Infectious” transplantation tolerance. Science 259: 974–977.
. 2006. Infectious tolerance and the long-term acceptance of transplanted tissue. Immunol. Rev. 212: 301–313.
. 2002. Human CD4(+)CD25(+) regulatory, contact-dependent T cells induce interleukin 10-producing, contact-independent type 1-like regulatory T cells [corrected]. [Published erratum appears in 2002 J. Exp. Med. 196: 559 and 2002 J. Exp. Med. 196: 867.] J. Exp. Med. 196: 247–253.
. 2002. Infectious tolerance: human CD25(+) regulatory T cells convey suppressor activity to conventional CD4(+) T helper cells. J. Exp. Med. 196: 255–260.
. 2011. In vitro treg suppression assays. Methods Mol. Biol. 707: 21–37.
. 2005. In vitro expanded human CD4+CD25+ regulatory T cells suppress effector T cell proliferation. Clin. Immunol. 115: 3–9.
. 2001. Human cd25(+)cd4(+) t regulatory cells suppress naive and memory T cell proliferation and can be expanded in vitro without loss of function. J. Exp. Med. 193: 1295–1302.
. 2008. T regulatory cells in autoimmune diabetes: past challenges, future prospects. J. Clin. Immunol. 28: 677–684.
. 2009. Regulatory T cell suppression is potentiated by target T cells in a cell contact, IL-35- and IL-10-dependent manner. J. Immunol. 182: 6121–6128.
. 1998. CD4+CD25+ immunoregulatory T cells suppress polyclonal T cell activation in vitro by inhibiting interleukin 2 production. J. Exp. Med. 188: 287–296.